Developed by local firm Sedgewick Properties, Marquee is just a few minutes walk from Millennium Park, Chicago's answer to Central Park, where Barack Obama made his acceptance speech on the night he was elected president. Marquee is also convenient to the lake front, a major water leisure amenity where Chicagoans walk, jog, cycle, stroll or just chill out. Always interesting to see how foreigners talk/hear about our city and neighborhood. Our alderman has also been picking up a lot of steam by hosting town hall meetings lately, the second year in a row he’s organized the sessions, wherein Bob talks about the importance of calling 311 (a common reminder from him) and introduces staffers like Luis, the ward sanitation super. The town halls are organized by region — east region, south region, mid-north region, west region. Who knew our ward had so many regions? He’s doing community meetings a mile a minute, too — everywhere that more than two chairs can fit in a room and at least one Doubting Thomas has a question or concern. He schedules appearances wherever ward residents get together: school meetings, block parties, fence dispute demilitarized zones. Alcohol Tax Could Cost Chicago Olympics? "Having a vibrant restaurant and nightlife scene is an important component of Chicago's bid to be recognized as a world class city capable of hosting the Olympics," the ads declare. "If this alcohol tax goes through, Chicago will become a significantly less attractive candidate for the 2016 Olympics"
This is a pretty ridiculous statement...we highly doubt that the IOC will even consider something like this. Regardless about how you feel about the tax, one thing we're certain of is that this tax isn't going to cost Chicago the chance to host the 2016 games. If you are interested in the plan and architecture behind One Museum Park and other central station developments we highly suggest you take a look and listen to the lunchtime lecture put on by the Chicago Architectural Foundation. Jeff Renterghem, one of the architects that helped with the development, talks through various topics (One Museum Park East, Museum Park and the Central Station Planned Development). For the audio of the lecture, click here. For the corresponding powerpoint, click here and go down to the lecture on March 25th. Highly entertaining if you're into this type of stuff! Shot looking South from Printers Row. Open thread about the 2016 Olympics. Please let us know what you think. Open thread about hot topics in the Sloop. This can be any thing you have questions about it or problems with. Please let us know what you think! Open thread about the best restaurant in the Sloop. Please let us know what you think! Open thread about real estate development in the Sloop. Please let us know what you think! Open thread about parking in the Sloop. Please let us know what you think. Open Thread about Alderman Fioretti. Please let us know what you think about him. What he's doing right, wrong, etc. Many people have concerns, questions and topics that they would love to see covered on Sloopin. We are going to do our best to follow these topics but are also hoping for help from our readers. With that said, we are going to start some open threads that ideally will serve as conversations and as a place for the greater South Loop community to discuss rumors, pose questions and tackle issues that might be hot topics. The goal is to have topics that readers will comment on and provide their opinions. We will start with some basic topics, but feel free to email us at sloopin@gmail.com to suggest other topics you would like to see covered. You will find the “Open Threads” listed at the top toolbar. We’ve started a Sloopin Facebook page for a couple of reasons. A) Most everyone is on Facebook these days, so it will hopefully serve as a good place to find and converse with residents or people interested in the Sloop. B) There is a “Discussions” tab that allows Sloopin fans to talk about issues or whatever they want. Again, this hopefully will prove to be a good resource for the neighborhood. There is a Facebook logo on the right side of Sloopin. Simply click on that and it will direct you to our Facebook page for you to become a fan. Thanks for the support and keep the feedback coming! Museum) located at 1801 S. Indiana. drawings developed by the Chicago Park District. Chicago 2016: Winner By Default? Tokyo, by some accounts, may have slipped a bit; Rio de Janeiro showed both its strengths and its flaws, and Madrid, however technically well qualified, is still located in a Europe that already will be hosting the 2012 Summer (London) and 2014 Winter (Sochi, Russia) Olympics. That leaves Chicago, despite its lovely weather, about where it has been for a while now: Perhaps the front-runner, and certainly in it as the race heads to Switzerland. Believe it or not. 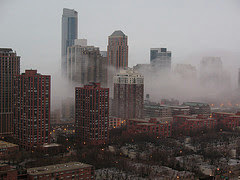 We posted some of the arguments against Chicago's competitors a couple of days ago. I have a nifty way to get Chicago over the top but it will take some collaboration among banks, developers, the City, and 2016. One of the major hurdles for our bid is getting the development community behind the Olympic Village, which will cost upwards of a billion bucks and flood the South Loop with thousands of unwanted condos. There are thousands of unsold South Loop condos now. Why not reposition some of these developments for future Olympic use? Everyone wins - developers, banks, Olympic backers. And we will all look like heroes for cutting costs and helping to alleviate the global real estate crisis. The PR value of strategy alone is huge. It's time to get creative and seal the deal for Chicago 2016. Although we applaud Charles P for the creative thinking, that approach is logistically flawed. The IOC has specific rules in terms of athlete housing and all these 'empty' units in the South Loop have different floor plans. As a result they would have to be reconfigured to meet the IOC standards, which would be a nightmare. They also want a centralized village (which this idea wouldn't address) and the 'empty' units are vacant now...but probably won't be by 2016. In honor of our poll on the right, we found a post by YoChicago that talks about construction updates at One Museum Park West. It also gets into the units that are available at One Museum Park and OMP West. Wednesday evening, community members and parents of South Loop Elementary School (SLS) students will gather in the school's auditorium to discuss increased enrollment at SLS and the school's future. The meeting is organized by the Greater South Loop Association and South Loop Neighbors, and starts at 7 p.m. The organizers ask people who want to speak to arrive between 6:15 p.m. and 6:45 p.m. to sign for the comment period. Thanks for everyone who participated in the poll! Not surprisingly Motor Row and Printer's Row emerged as the two areas that people thought would be the bar/restaurant/entertainment areas over the next 10 years. In our opinion, Printers Row is well positioned because of it closer to various CTA stops and the growing "Loop U" area where Columbia and Roosevelt Colleges continue to flourish. Motor Row also seems well positioned mainly because of the city's investment in the area. The street scape on Michigan Avenue from Roosevelt down to 16th looks great (assuming all the retail fills in eventually). This area also has a ton of residential which in theory should support a thriving retail corridor. Roosevelt will probably be more of a mass retail area which is evident by the big box retailers that are already on the street (Best Buy, Home Depot, Target, Whole Foods, etc). The other option in the poll was the Cermack Corridor. This is the dark horse and probably will take the longest to develop. Again this area seems to be sitting pretty as it is just a matter of time until the city focuses resources to this area. It's obvious that McCormick Place and Chinatown are city priorities and if the city wins the competition to host the 2016 Olympics you can expect this area to blow up...very very very quickly! And finally the PC statement...they all will be great...who can argue with that? In all seriousness, post a comment and let us know who and why you voted the way you did. It's interesting for us to hear different perspectives on the evolution of the area. As we posted a couple of weeks ago, Chicago has recently unveiled a plan for many neighborhoods in the downtown area. Many of these plans affect various areas of the Sloop and as a result we are going to have some posts over the next couple of weeks looking into these changes. Some of the changes are already underway, but most are plans that could happen sometime before 2020. Will they happen? Who knows, but it's still good to consider. In the first post about the river south area we mentioned how the north portion of this area has developed a lot over the past ten years. Now we're going to talk about the south portion of River South (which is the area south of Roosevelt bound by 18th street on the south, Clark on the east and the Chicago river on the west). As mentioned before this area is gigantic. There was a rumor a poster mentioned about a proposed IKEA that fell through, but besides that we don't know much about this area. Judging by the city's plan, we figure this will be various mixed use retail and residential (maybe like Roosevelt Collection, which is currently being built). However, there might be an abundance of retail that the Sloop doesn't need and as a result this area might be best served to be completely residential (like Dearborn Park I and/or II). We would love to hear your thoughts on this huge piece of land. The image to the right details more plans from the city for the River South area. The biggest improvement would be the "Wells-Wentworth" connector which would add an arterial street and restore the city grid structure to this area (noted by dotted line 1). We think this is a much needed addition and something that would make this area highly desirable as it would better connect Chinatown to Printers Row and the rest of the downtown core. We've already spoken about a couple of the improvements labeled on this map (bridges noted by dotted line 3), but some of the other ones are the infill orange line station (noted by the 7) and the river walk (noted by the 4). Both of these improvements would do wonders for the area. Although we've said before that the river walk would be great, it really isn't practical right now. The Orange line stop at 18th and Clark would be a massive improvement and in our opinion would help spur future development in this area. The one thing that isn't mentioned is that this stop would only serve the Orange line even though the Green line also could stop there. Maybe we're missing some logistical issue, but we really feel like this proposed stop should be one for both the Orange and Green line. Remember the scene from Garden State, when Diego (Method Man’s character) is in the back hallways of a hotel peaking into guests rooms watching them do all sorts of crazy things? Remember the sultry beats and twang of the sitar adding to the seediness of the scene? Well if you liked that scene then we suggest you head down to Lollapalooza this year to check out Thievery Corporation. Watching this movie was the first time we were exposed to the talent of Thievery Corporation and we’ve been fans ever since. Similar to many acts at Lollapalooza it’s hard to categorize Thievery Corporation. They blend a variety of styles and in our opinion would perfectly fit in at a laid back lounge. According to Wikipedia their genre would be “Lounge, Dub, Trip hop, Downtempo”…whatever that means. They did play Lollapalooza in ’06 during the afternoon/early evening and it was a solid show. They brought out a ton of different musicians and singers which made the show entertaining and energetic. We’re hoping for a time later in the evening as a great light show would amplify the ambiance and experience. Check out their myspace page for other tunes and hit em up at Lolla if you’re going. Zapatista…it rolls of the tongue nicely and is simply just fun to say…Zapatista. We’ve walked by this lively Mexican restaurant at 1307 S. Wabash well over a 1,000 times and for some reason never went in. We’ve heard good things and judging by the vibe oozing from inside it was finally time to try out this local spot. It was an impromptu Friday night evening with some friends and thankfully we had no issues getting a reservation at 8pm. When we got to the restaurant it was impossible not to notice the buzz inside. The main dining area was full and the bar was packed. The lighting throughout the place was low and the walls were relatively plan (or at least that's what we remembered). If you read our review about La Cantina (another solid Mexican spot in the Sloop), you probably remember we love guacamole. So once the waiter came we put in a quick order for the green stuff. The girls went with margaritas and the men went for standard Mexican beer. I personally opted for Dos Equis solely because I’m a sucker for great marketing (and the most interesting man in the world drinks that stuff…stay thirsty my friends). The margaritas were strong and seemed to be well received by the ladies. The house salsa was ok and had a kick, but honestly wasn’t anything to write home about. The guac on the other hand was great! 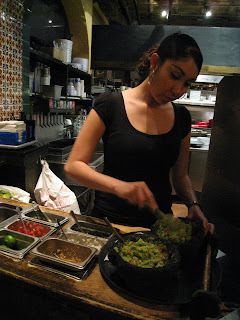 They had one of those rolling guac stations where the staff makes it right in front of you (although they didn’t actually make it at our table for some reason). It was obviously very fresh, but unfortunately the serving size was relatively small. Onto the main courses; a Pork Chop, Quesadillas, a Burrito and Tacos. Besides messing up the Burrito order (we asked for no beans) the food came relatively promptly. The results were mixed though. The Pork Chop and Quesadilla got good reviews but the other two were just mediocre. All in all it was a solid experience and something we would definitely recommend (especially if you’re a fan of “Americanized” Mexican). We will probably head back at some point, but next time we definitely want to sit outside. According to an associate press report out of Paris, Chicago is still the leader to host the 2016 Olympics. Although these types of reports have to be taken with a grain of salt, it's still encouraging for people who support and are looking forward to the opportunity of hosting the games. The article cites anonymous IOC sources and others closely associated with the Olympic movement. To be honest, no new topics or subjects are reported in this story, but it's still reassuring to hear that the same thoughts we've read about are still prevalent. The article didn't really make much of an argument for or against Madrid, but the biggest reason as to why it wouldn't be there is because London is hosting 2012 and they do like to rotate throughout continents (so the thinking is they would want to avoid Europe in back-to-back summer Olympics). However, they do have the most infrastructure (stadiums and transportation) already created in the competition. Rio certainly has the passion and the lure of being the first South American city to host the Games but the feeling still persists in some members eyes that Brazil will just have come out of hosting the World Cup in 2014 and they don't want to be seen as one Asian member put it 'the dessert after the main course'. So much contemporary creative expression is concentrated on the Net that the idea of a live youth-oriented arts fest downtown gets our our attention. Today, Columbia College’s urban arts festival turns the streets of the South Loop into a veritable canvas with performance art, music and auto-inspired art all in the mix. Tonight, Chicagoist tells us, there’s the Spectacle Fortuna parade with hundreds of giant puppets inspired by Ray Bradbury novels. South Loop locations, 11am–7pm. FREE! Great shot from the unbelievably talented people at The Windy Pixel. Although Millennium Park and Buckingham Fountain get much of the praise and attention, some of our favorite, most beautiful and unexpectedly serene places in the park are home in the Sloop. This shot is from the flower gardens next to Michigan Avenue (between 8th and 9th street). "If You Can't Sell Them...Rent Them"
In the case of Opera Lofts, sales manager Kathleen Ryan says the hope is that renters will enjoy the development enough to consider buying a home there later on. It's not surprising that the South Loop Elementary school's enrollment is growing. The neighborhoods that it serves have seen an increase in residents and families recently. Add the recent recession, which is probably causing "private" school parents to think twice about paying rediculously high tuition, and you can see why capacity issues might become a problem. Today the Chicago Journal does a good job reporting on this so called "buldge" and talks about whether or not this is going to be a continuing problem. They also tackle some potential solutions if this problem continues to persist. For families in the area with small children it's a good and informative read. 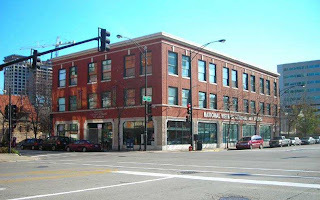 Although the Motor Row Lofts (2301 S. Michigan Ave.) may have wrapped up construction, sales of the condos have stalled. According to Crain's Chicago, this has resulted in a foreclosure suit against the developer. This should not diminish from an area that I think has the best potential when things rebound. Like it or not, Cermak is the new Roosevelt of 1997. So many positive things potentially happening; Ickes Home demo, Olympics, possible Green Line Station, McCormick Place completion, etc., that this area is a sleeper on snooze for another year or two. I just cringe when I hear crying fights on the phone. Last week it was a young woman in her late teens who seemed to have her head on straight -- except perhaps for her choice of boyfriends. She made quite the scene at 7:30 am on the Red Line headed toward the Loop. We've been watching the 2016 Olympic bidding process closely and one of the biggest stories so far is President Obama's role in Chicago's bid. Many internal and external observers have mentioned how important he is to Chicago's chances. Yesterday, the political blog, Politco, had a lengthy article on Obama's relationship with the bid. If you're interested in this angle of the Olympic story we highly recommend that you read this link. Four of the five co-chairs of Obama’s inaugural committee have unpaid leadership roles in the Chicago bid, including Pat Ryan, the chairman and CEO of Chicago 2016; John Rodgers, the treasurer and director of Chicago 2016; Penny Pritzker, the hotel heiress who led Obama’s meteoric presidential campaign fundraising; and Bill Daley, the former Clinton administration commerce secretary and brother of the Chicago mayor. Rania Elwani, an IOC member from Egypt who said she adores Obama and has a picture of him on her refrigerator, said the president’s support for Chicago’s bid would definitely have an impact on her vote. Chicago 2016 officials have alternated between predicting Obama’s attendance (in Copenhagen for the IOC vote) and trying to manage expectations — and nearly every IOC member interviewed for this story warned it might hurt the bid if Obama did not make the trip. After all this planning, all this build-up and all this money spent, does it simply come down to whether or not Obama goes to Copenhagen? We would be shocked if he doesn't make the trip. If he does our guess is that Chicago wins. If he doesn't, chance are that we will be watching beach volleyball on the beautiful beaches of Rio de Janeiro. Blackhawks Win; Villians Bar & Grill Erupts! If you haven't jumped on the Chicago Blackhawks Bandwagon yet, it's about time. Since we couldn't score tickets to the new mad house on Madison (aka The United Center) to watch game six of the Western Conference Semi-Finals contest between our beloved Hawks and the despised Vancouver Canucks, we headed up to Villian's bar and grill to catch the game. Most of the games in the series have been defensive battles, but not this one. All we can say is wow...what a game! What a goal! What a game! What a night! It's hard not to notice some of the CTA's 'user experience' upgrades that have been happening recently. Last year they introduced the bus tracker which really blew our socks off. Their website redesign also was a positive in many peoples eyes. There are still a ton of problems with the CTA, but they're making progress. A couple of weeks ago the CTA Tattler had a post about the installation of 52-inch flat screen TVs at the Addison red line stop. The screens serve up information such as when the next train is coming as well as ads. We recently noticed that these same flat screens were installed at the Roosevelt stop (green/orange line platform). As of today they weren't functional, but we imagine someone will flip the switch soon. According to the Tattler, this won't cost the city any money and will bring in $101 million over the next ten years thanks to ad revenue. Up until March 30, 2003 it wouldn't have been uncommon to see small planes buzzing around the south side with the intentions of ultimately landing at Meigs Field Airport on Northerly Island. However, now it's not very common since Mayor Daley infamously ordered private crews to destroy the runway in the middle of the night, bulldozing large X-shaped gouges into the runway surface. That's why we were surprised to see the shot above which was sent to us recently by a reader. Obviously the plane didn't land or take-off on the island, but it's still an interesting shot. We don't have much context about the pictures, but for the full reel check out this link. If anyone knows more about these shots let us know. The three other cities all have fantastic bids. The Tokyo bid is superb, probably the best of all. Madrid has most of the Olympic infrastructure in place, a great transport system as well. Rio has a big advantage too in that the Olympics have never gone to a South American city, and it's probably about time they did. But Barack Obama is going to show up in Copenhagen in October. He'll work the room for about 20 minutes and that will probably be enough to swing it for Chicago. The same as Tony Blair swung it for London. As predicted by us (and everyone else), the IOC 2016 Olympic evaluation committee wrapped up it's final candidate city visit in Madrid and promptly declared that it was "most impressed" with the bid. This statement was almost identical to statements made about Chicago, Tokyo and Rio. So at the end of the 4 city tour we don't know if any difference has been made in the eyes of the IOC. All we know is that from a public relations standpoint every city didn't have a major gaffe. A new park covering the space between the Rowe and Transportation buildings in Printers Row, an area in the middle of the block on Dearborn between Harrison and Polk, was originally slated for completion for the end of 2008. But the Chicago Park District had difficultly hiring a contractor to complete the work. According to a recent article in the Chicago Journal, it looks like construction should be starting soon and is scheduled to be finished around September 15th. The article also goes on to talk about the city's plans to convert the old National Vietnam Veteran’s Art Museum (1801 S. Indiana) into the South Loop’s first park field house. A couple months ago we read another story about this project if you want more background. Finally, something that's new news to us is a potential new park at 1611-29 S. Wabash. This empty parcel of land is located on the east side of Wabash and would be next to the proposed expansion of the True Rock Ministry (which has signs up about an expansion to the corner of Wabash and 16th). We love parks and are happy to see the city investing in green space for the neighborhood! Starting Monday, May 11, the Polk Street entrance will serve as the primary entrance to the Harrison Red Line station while the Harrison Street entrance is under construction. The Polk Street entrance is one block south of the Harrison entrance at the southwest corner of Polk and State. The Harrison Street entrance will remain closed for five months in order to replace the escalator that connects the mezzanine to the platform. Seems like a long time to fix an escalator. The CTA Tattler has more info and commentary here. The city has broken up the area we consider the sloop into various specific neighborhoods (which is reasonable since it's a relatively large area). The River South neighborhood is a name we've never heard of, but has a ton of potential in our mind. According to the plan this are is bound on the north by Congress, the Chicago River on the west, Clark street on the east and 18th street on the south. Roosevelt road intersects this neighborhood and really showcases the difference in the two areas. To the north, River City, Target and the under construction Roosevelt Collection stand out (with other residential buildings). There are a couple huge lots that have a lot of potential and almost certainly will get developed at some point. South of Roosevelt is a different story. This gigantic 62 acre area is completely desolate. Commuter Metra trains runs through the area, but besides that it's a huge empty, grassy lot. Again, this provides a huge development opportunity for the future as it's a prime, large piece of real estate. We envision a great residential neighborhood similar to Dearborn park 2 (directly east of this area), but by no means is that necessarily going to happen. In part one, we are going to look at the area directly north of Roosevelt. This area has already seen recent development in the form of Target and AMLI (among other buildings). The biggest recent project is currently still under construction, Roosevelt Collection. Franklin point (which is directly south of Congress and next to the Chicago River) is also a big planned development, but has recently been put on hold according to some reports. The riverfront path would greatly benefit this area mostly from a quality of life perspective but in our mind this is a great to have, but not necessarily a must have. Probably the biggest two improvements would be the potential bridges at Taylor and Polk that would cross the Chicago River. This would help the River South area become connected to the South West Loop (which we posted about before). Another big improvement would be the Wells-Wentworth connector which would provide a new street connecting the northern parts of the sloop to the southern. The blue areas on the map above are deemed opportunity sites. Right now they sit vacant, but serve as enticing and interesting sites for future planning. Does anyone have any insight on what they would like to see in these sites? Is the area missing something? Do we need more of something (townhouses? retail? new football stadium? casino? school?)? Yep, our lovely neighborhood is home to the longest active strike in the United States. If you haven't noticed the picket line in front of the Congress Plaza Hotel (Michigan Ave & Congress), then we suggest you get out more often. The group UNITE HERE local 1 is in charge of the protest and they even have a website. Little progress has been made since the détente began. In fact, Congress employees watched UNITE-HERE win another contract for the city’s housekeepers in 2006, meaning the Congress’ average hourly wage of $8.21 now sits 37 percent below the region’s average. Erected within spitting distance of Chicago’s Grant Park on the eve of the 1893 World’s Columbian Exposition, the Congress prided itself on providing a luxurious resting spot for the world’s well-to-do. Its opulent banquet hall was the first American hotel ballroom to use air-conditioning. Its chic nightclub featured a revolving bandstand of the nation’s finest musicians, including bandleader Benny Goodman, who recorded his radio show on location in 1935 and 1936. It was even dubbed the “Home of Presidents,” playing host to eight commanders-in-chief (Cleveland, McKinley, Roosevelt, Taft, Wilson, Harding, Coolidge, and Roosevelt) and serving as the Democratic Party’s headquarters throughout the 1932 election cycle. Now the only thing the hotel and presidents have in common is the picket line. Politicians and even presidential candidates often stop by to offer their support (such as candidate Obama and John Edwards). It's an interesting story on many fronts and one that doesn't seem to be going away any time soon. Walking, running, biking and even rollerblading is fine in our book. However, nothing seems more silly to us then the Segway. Yes, when they first came out in 2001 we thought they looked interesting and potentially fun, but seriously...these things are stupid. With that in mind, we bring you a new feature on Sloopin we like to call "Segways...Seriously?!?!?". We are going to do our best to capture images of the shenanigans and silliness that come with Segways. Regardless of your feelings about these two wheeled transportation thing-a ma-gigs you can't help but notice them scooting around the Sloop. They mostly tend to be tourists, but every once in awhile we will see Chicago's finest patrolling the streets on these machines. We will continue to take pictures when we see them in the Sloop, but if you see anyone grab your camera or take out your cell phone and take a picture and send it to us at sloopin@gmail.com. Extra points to anyone who can find an actual resident riding around on their Segway. "Rebirth of South Loop Cool"
The South Loop used to be one of the most thriving nightlife neighborhoods in the city. The Cotton Club on Michigan Avenue was the place to be. And back when Chicago house music was the main beat of the underground, many of those clubs were located in and around the SoLo -- or the Sloop -- or whatever you want to call it. Late night options in the area have been sorely lacking, but that will change in June with the opening of Shrine (2109 S. Wabash St). Joe Russo, the founder of The Funky Buddha Lounge and several other concepts in Chicago, is behind this new venue. It's described as a "new hub for music across an eclectic cross-section of genres" and a destination for "culturally aware urbanites." The 8,000 sq. ft. venue can accommodate more than 600 guests. Connected to the main club area is a small, upscale lounge called Coup d’état, complete with it's own separate DJ, bar and service staff. Once a month the venue will feature an "Eyes Wide Shut" series featuring A-List hip-hop, R&B and reggae artist for the same $20 cover charge. These are acts that usually play in larger arenas that you'll now get to see in an intimate setting. For more songs and information check out their myspace page. For those of us who enjoy running, walking, biking or doing whatever along the lakefront a much needed improvement to the path has finally opened. The Solidarity Drive underpass, which enables people utilizing the path to continue their activity without having to stop at Solidarity Drive, is now open and looks pretty great in our opinion. Solidarity Drive is the street that allows buses and cars to get to the Adler Planetarium, Charter One Pavilion and other things on Northerly Island. In the past, this break in the lakefront path was seen as a huge inconvenience and unsafe for pedestrians. The new underpass solves this problem. Although landscaping and minor finishing touches need to be completed, the underpass is functional and we got our first peak at it this past weekend. For more information here is a link to a CDOT description of the project. The 56 percent figure for Tokyo was dramatically at odds with the bid committee's own findings and those of Japan's mass circulation Yomiuri newspaper. A senior Tokyo official confirmed the IOC figure to Reuters on Saturday, while pointing to results of the bid committee's own survey carried out in January. Tokyo bid leaders said 70 percent of those interviewed nationwide supported the plan to stage the Games, two percent more than the backing of the city's residents. A recent Yomiuri poll put support from Tokyoites at 76 percent. Looks like we will have to wait until September to find out what the IOC's poll for Chicago and the other competitors found. Madrid 2016 Spies on Rio's 2016 Bid? According to gamesbid.com, Rio has accusing Madrid of spying on their bid presentations last week. Does this matter? Probably not, but it's funny how dramatic this whole process can be. For those of you who are as fixated on the Olympic coverage as we are, here is a good recap story by the New York Times on the IOC's visit to Rio to evaluate their 2016 Olympic bid. The IOC leaves Rio with a great photo (see above) and various other politically correct statements. The main story out of the visit was that there wasn't much of a story. In the press conference following the evaluation, the same adjective was used to describe Rio's bid as was used for Chicago, Tokyo and we imagine for Madrid next week: Impressed. As we said before, we're not going to get a good read until the evaluation committee releases its findings in an extensive report in September. For now, we have to rely on stale and predictable press conferences. 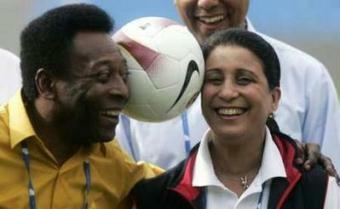 At least we got some funny photos out of this one. Earlier on Saturday the Folha de Sao Paulo newspaper reported that street dwellers had been rounded up in three key areas of the city before the inspection team visited. The newspaper said their reporters witnessed the homeless being placed into buses and taken away. The city government was quoted by the newspaper as saying it was a routine operation. Until New West cleans up its act by removing from the Web all of the deceptive information it's planted, this site will not write any posts on New West projects that rely on information furnished by New West. "Bargain lovers, treasure hunters and vintage fanatics of all ages will find something to buy or sell at this exciting one day event," so says Sally Schwartz, organizer of the new Big Swap Bonanza, to be held Saturday May 2 at Soldier Field, outdoors in the South parking lot. The Big Swap Bonanza, Chicago's Biggest Yard Sale, comes to Solider Field on Saturday, May 2nd. Gates open for sales display set up at 5:00 a.m., and shoppers can arrive as early as 7:00 am, rain or shine.